Last year was one of the coldest winters on record with extremely heavy snowfall; I won’t soon forget it. As temperatures started to drop this past fall, I couldn’t help but fret about what winter would have in store for us this year and how it would take its toll on Peanut’s potty time. Considering how difficult the whole process was for all of us and knowing that her little body would be taxed even further with age, I really wanted to make this season easier to manage. My first thought was to buy an outdoor dog kennel and cover it with tarps or boards. There was much discussion between Joel and I about the ideal size of the kennel, how much to spend, how much work it would involve, the likelihood of Peanut actually using it, etc. After all, we tried using a bottomless camping tent outside a few years ago but we believe she did not use it because she thought she was still indoors. I searched craigslist often over several weeks to find used kennels that might fit the bill but we never found anything that stood out as the best option. Just when I thought this project was not going to happen, Joel proposed boarding up the sides of a pole tent we already owned. Our project was a go. A fine-looking potty tent indeed! It has been over two months since we built the potty tent. I’ll cut to the chase and share that it has been a complete success ! We could not possibly be happier with the tremendous relief from the hassles of winters past. Why? No getting knocked over by high winds!! Instant access to clear, odiferous grass!!! 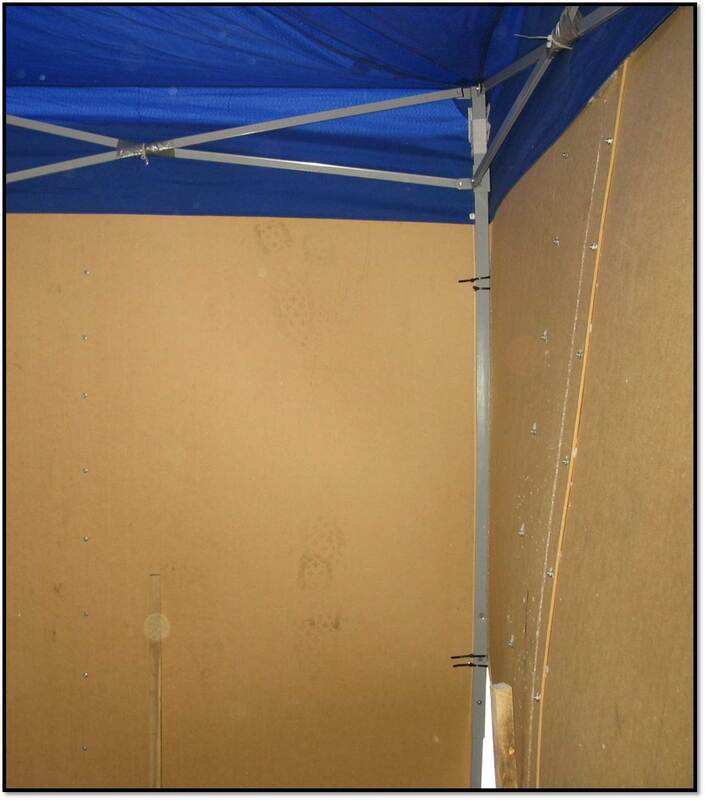 The following is based on using the materials above and Joel’s measurements for our particular tent. Confirming our plan: We put up the tent and picked out what we believed would be the best spot. We considered the distance from the door to the house and direction of wind. Preparing the boards: This was a weekend project that Joel approximates took about eight hours. This included cutting the boards down two feet each in length so that they would not be taller than the tent. Boards were placed flat on the ground and overlapped about one foot on either side. For our tent, this meant using three boards per side for a total of nine. Joel then glued the overlapped sections together so that he had three full sides for the tent. Lastly, he drilled holes spaced about ten inches apart through the overlaps so that he could add nuts and bolts for extra strength. Close up of glue, nuts, and bolts. 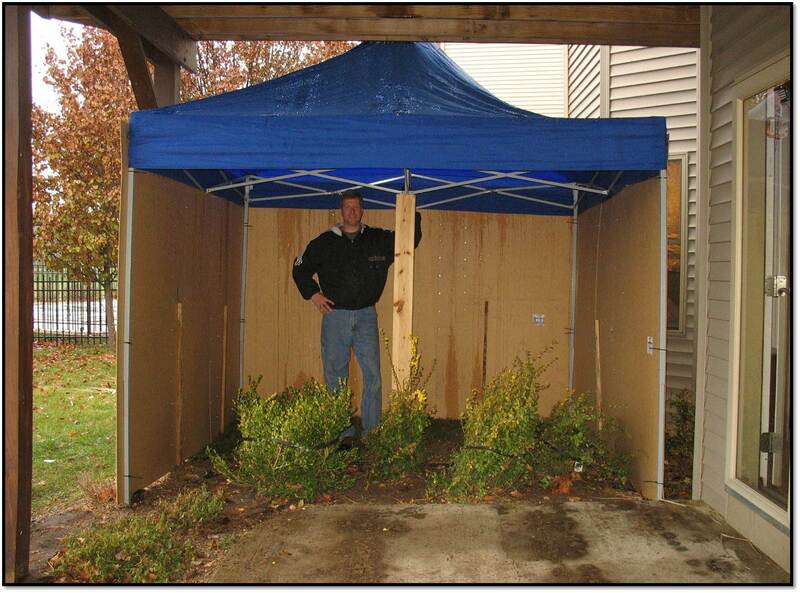 Attaching the boards: We transported the three tent walls around to the backyard where the tent had been erected. 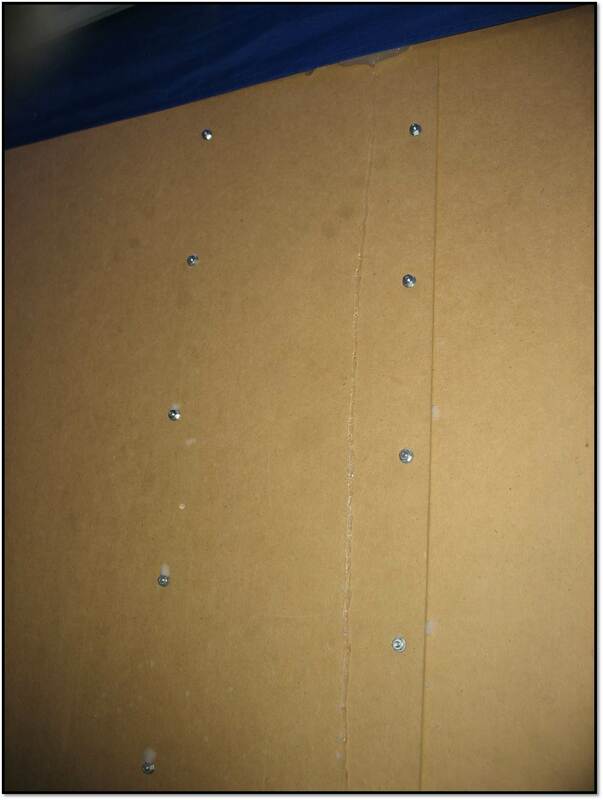 With the boards propped upright against the tent legs, Joel drilled holes into the boards where they met at the corners (top, middle, and bottom). This is where we fed the cable ties through, securing the boards to each other. Duct tape secures the tent frame. Cable ties (2 of 3 shown) secure boards at right angles. Slight buckling is is visible after two months. Securing the tent: The last steps included pounding in the wooden lawn stakes. This was meant to help stabilize the walls with the buckling and movement we expected to occur from winds and general outdoor wear and tear. 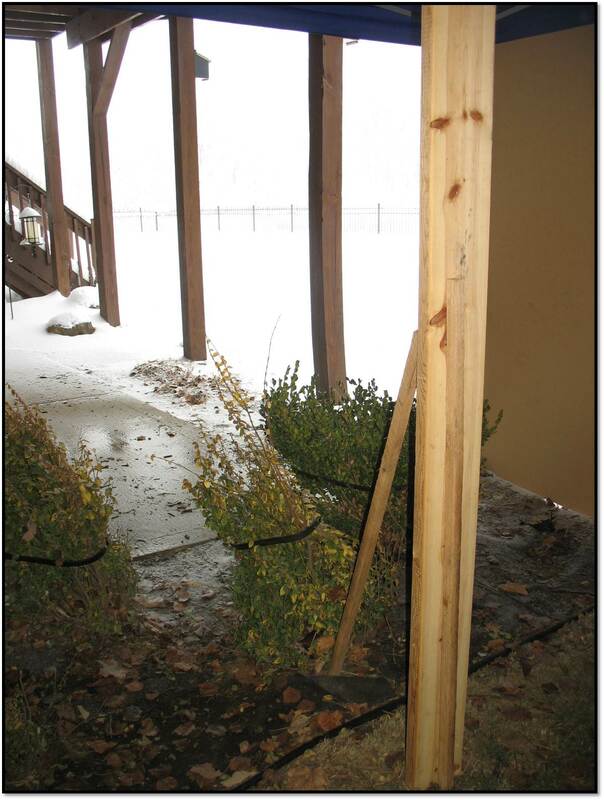 The stakes were added to both the inside and outside for stability and extra strength against wind. Two outside stakes are visible. This has to be done before the ground freezes. After two months’ time, the boards have buckled a bit but it’s not bad. We made it a point to brush off any snow that would collect on the top of the tent because the cover is only a thin canvas material. 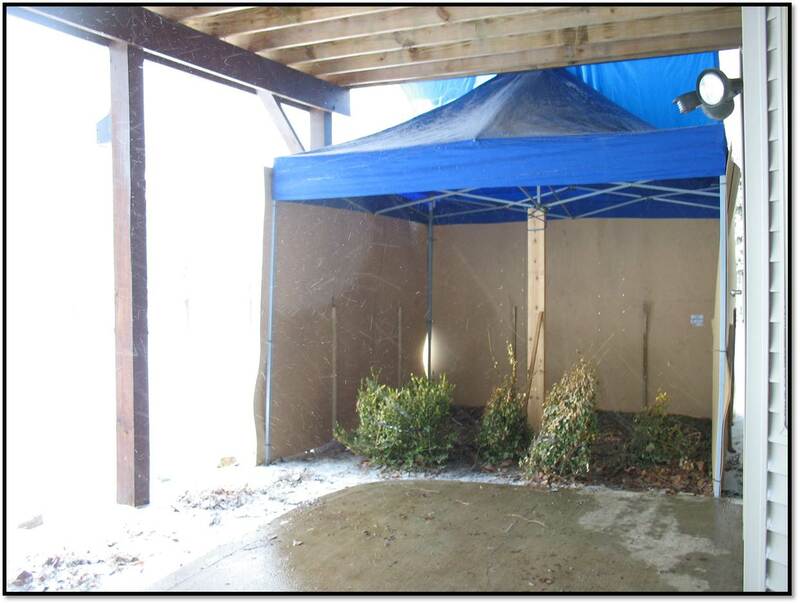 Because we grew concerned about just how much snow the cover could take, we added a tarp over the tent draped down at an angle from our deck for added security. I’m not sure how we would have reinforced the canvas top if we didn’t have this option. View of inside. Several wooden stakes support the walls on all sides. We’re delighted that the tent has provided an excellent barrier from snow and wind; it’s exactly what we hoped for and then some. The benefits we have all enjoyed have far exceeded the cost of materials and our efforts to build it. We don’t intend for this tent to be up year round, only for winter. It would be great if we could reuse these same materials, but if not, we will absolutely consider investing in sturdier components for future use. 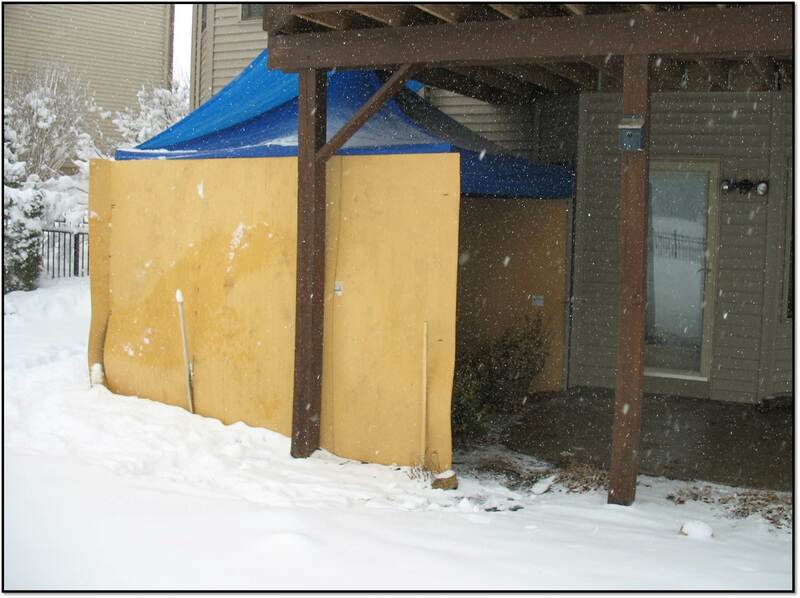 Hopefully others who have similar problems can use this idea to create their own wintertime potty oasis! Peanut gives the potty tent two dew claws up! *A little snow collected in the corners when winds were extremely high. **Peanut also made the connection that being in the potty tent equaled treats. Because she is so food-motivated and a bit too smart for her own good, she would go in there and do somewhat of a curtsy while staring at me like she did her part and now it was my turn. We had to once again start rewarding potty anywhere she went outside, just so long as she knew that inside the tent area was also an acceptable choice. UPDATE: My suggestion to anyone interested in researching options would be to also check out fabric sheds (aka temporary or portable garages) from big box retailers like Home Depot and Menards. Read the reviews for various sizes. You’ll likely find mixed reviews that some did and did not hold up in high winds and snow; I think a lot of it has to to do with how the shed/portable garage is set up, secured, and maintained. If you want to set-it-and-forget-it you have to get something really substantial and durable. Read what some folks did to strengthen and secure the structures. Notice how our tent has a wooden board dug slightly into the ground, centered in the very middle and secured to the top/center of the tent, providing extra stability against high winds. You. Are. Awesome. And probably the most amazing dog owners I’ve ever heard of! Hope this weekend’s blizzard didn’t make it unusable.